I’m trying to add more fish to our meal plans and this is one of my new favorite recipes. Heat a grill pan over medium-high heat for 5 minutes. Pat dry pineapple slices if using canned. If using fresh pineapple, slice each piece lengthwise into three strips. Arrange pineapple in a single layer in the grill pan. Cook for 2 – 3 minutes on each side or until grill marks appear. Remove and set aside. In a small bowl, combine the chopped onion, serrano pepper, parsley and salt. Zest line to measure 1 tsp. Juice lime to measure 1 Tbsp. Add both to bowl and set aside. Whisk taco seasoning mix and oil in a large mixing bowl. Add tilapia, turn to coat. Place two fillets in grill pan and cook 2 minutes or until grill marks appear. Turn tilapia over and cook for an additional 2 minutes or until fish flakes easily with a fork. Remove from pan. Wipe out pan and repeat with remaining fillets. As the tilapia is cooking, chop pineapple and add to onion mixture, mix well. 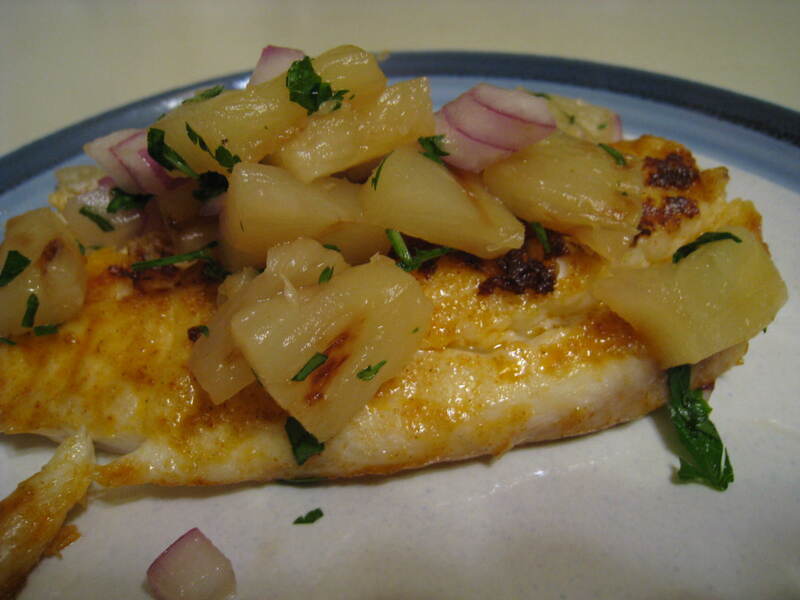 To serve, top tilapia with pineapple salsa.